After a week like the one just gone, where the S&P500 hit the 10% down threshold for the year, it’s perversely healthy to see debates rage about the likelihood of a recession, the future for oil prices, the bursting of the unicorn bubble, the impact of negative interest rates and the fallibility of central bank macro policy in the developed world, to name just a few. Considering and factoring in such risks are exactly what should be happening in a well functioning market, rather than one far too long reliant upon the supposed omnipresent wisdom of central bankers to answer any market ills that may come along. Although the market volatility during the opening months of 2016 hasn’t been pleasant and will hopefully find a floor soon, valuations didn’t reflect risks and an adjustment was needed. I have no idea where the market is headed, although I suspect we are just one more shake-out from capitulation. Valuations have come off their unsustainable highs and a select few are beginning to look attractive. After some of this week’s indiscriminate falls, it’s always a good risk management discipline to assess current and possible new positions in light of developments. I assessed AAPL’s valuation recently in this post and offered my thoughts on the new Paddy Power Betfair in this post. 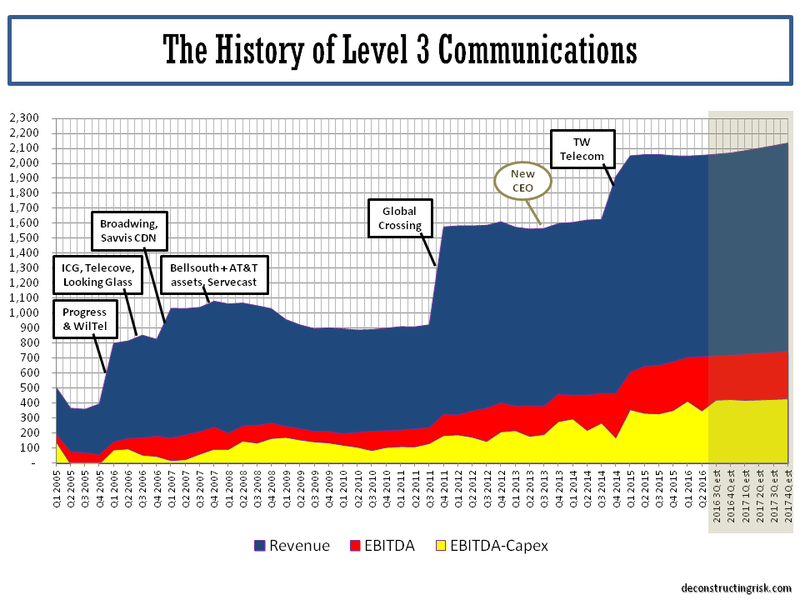 The subject of this post is Level 3 (ticker LVLT), a facilities-based provider of a range of integrated telecommunications services. 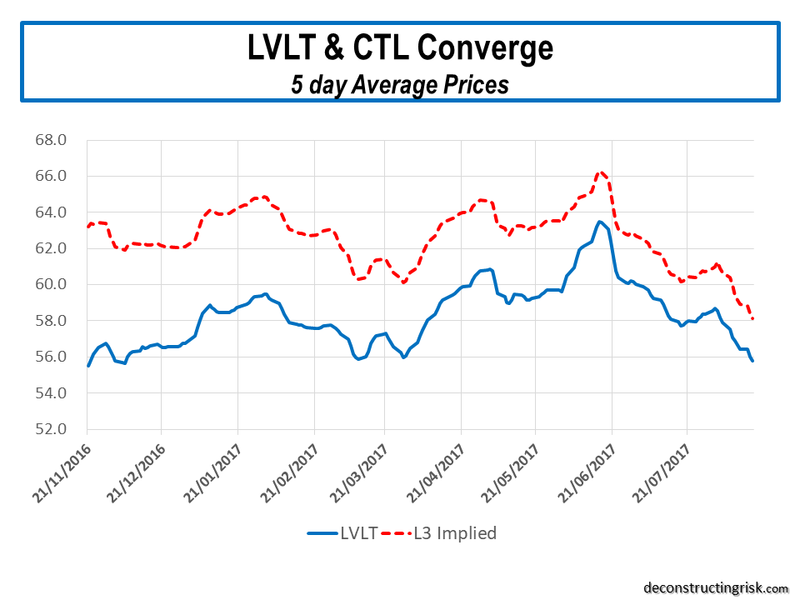 Prior to their earnings on 4th of February, I had been re-examining my investment rationale on LVLT, one of my highest conviction positions that I last posted on a year ago. As I have highlighted before, LVLT is not an investment for the faint hearted and the past week has again proven that (a beta level of 1.5 according to Yahoo just doesn’t capture it!) with daily moves following the Q4 report of +6.9%,-5.7%,-9.4%,+3.7%,+3%, 0.5%, and Friday’s +1.7%. The graphic below shows the movement in the share price in LVLT, the S&P500 and the S&P High Beta index (SPHB) since the start of 2015. Also shown are the daily changes in LVLT against those of the S&P500. As the talk of a possible recession fuelled worries on business telecom spend, I thought it would be useful to look at the historical “as if” results of the now enlarged LVLT through the financial crisis. 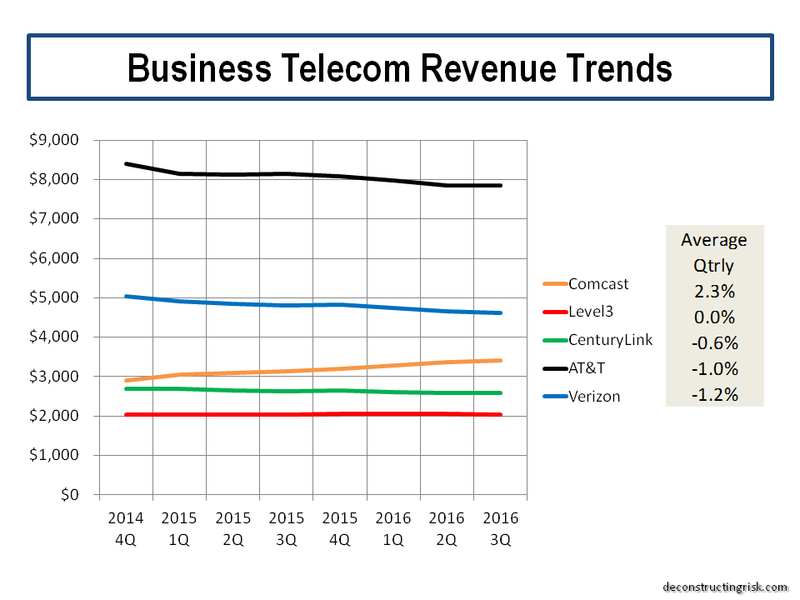 This involved looking through old Global Crossing and TW Telecom results and making numerous assumptions on the historical growth of acquired businesses and the business classifications (and numerous reclassifications) of each firm over time. The historical “as if” results combined with the reported figures for 2014 to 2015 and analyst estimates for 2016 to 2018 are shown below. 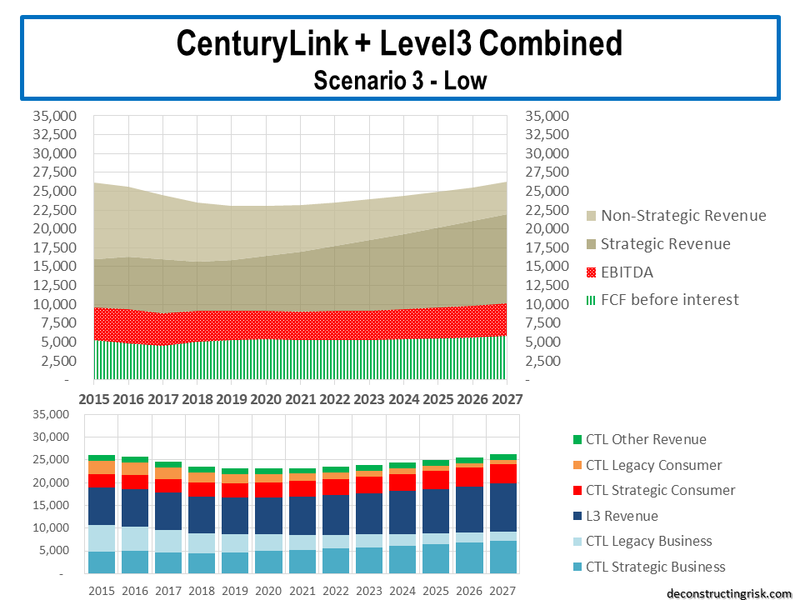 Within the context of the caveat above, the drop in enterprise revenue from 2008 to 2011 was 12.5%, primarily driven the financial crisis with other factors being Global Crossing refocusing its portfolio and the operational missteps by legacy Level3 in integrating its multiple acquisition from 2006-08. 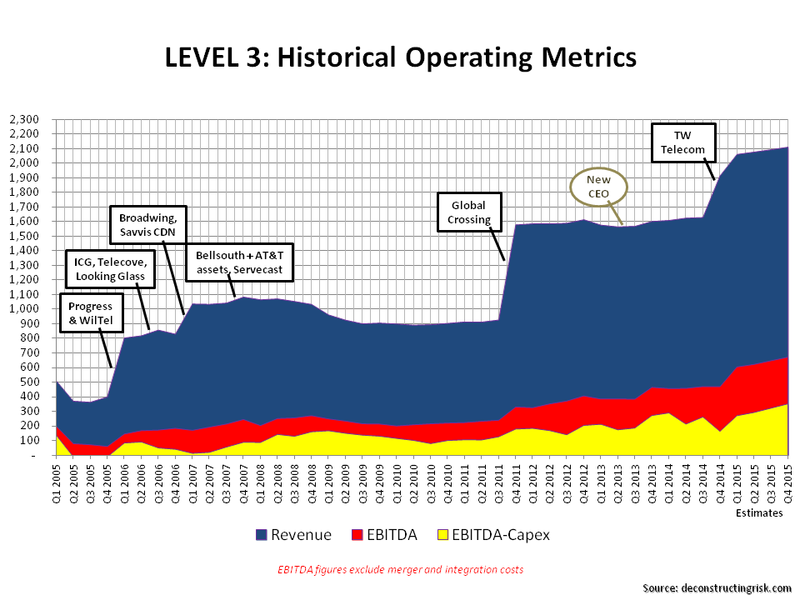 TW Telecom’s consistent top-line growth since 2007, despite the financial crisis, can be seen in this post. 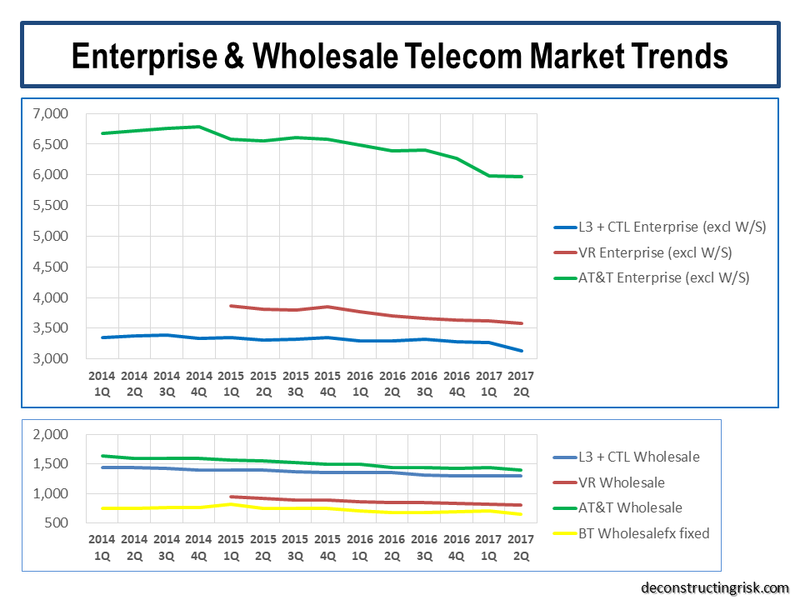 It’s interesting that the wholesale revenues have been relatively stable historically ranging between $2.10-2.35 billion, supporting the view that price decreases are offset by unit increases in IP traffic. 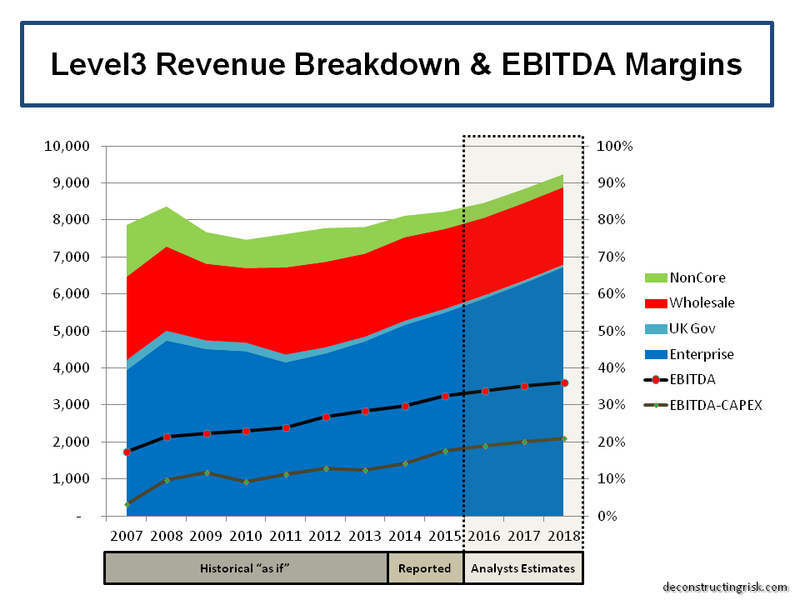 Since 2012, the benefits of scale combined with the integration prowess of the current LVLT management team (Jeff Storey became CEO in 2013) are vividly shown in the impressive increase in EBITDA margin from 22% in 2009 to 32% in 2015. After cutting capex in 2008-09, the combined business has required 14%-16% since then, now targeted at 15% to support the 8% annual growth in enterprise revenues (on a constant currency basis) that management have set as their target. 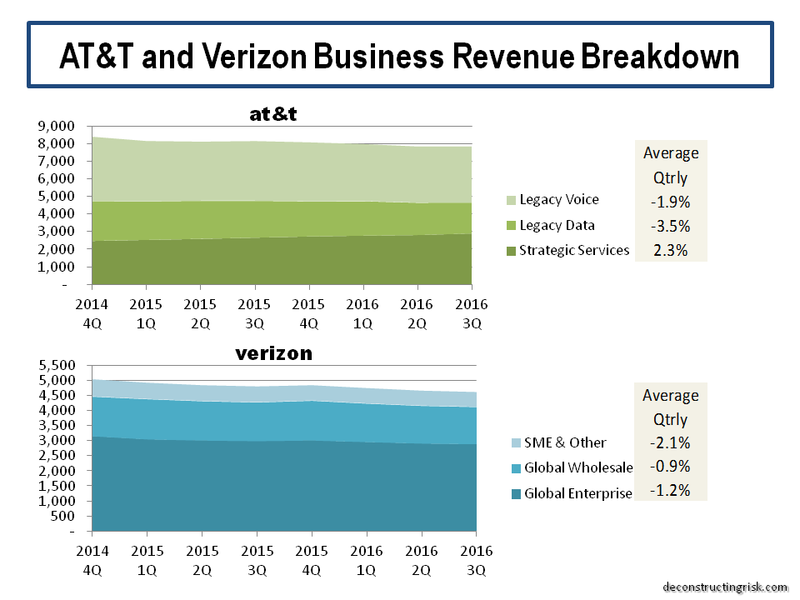 In Q4, LVLT’s revenue was derived 80% from the US and management claim that their enterprise business has only a single digit market share in the US leaving plenty of room for growth, particularly against the incumbents Verizon and AT&T. 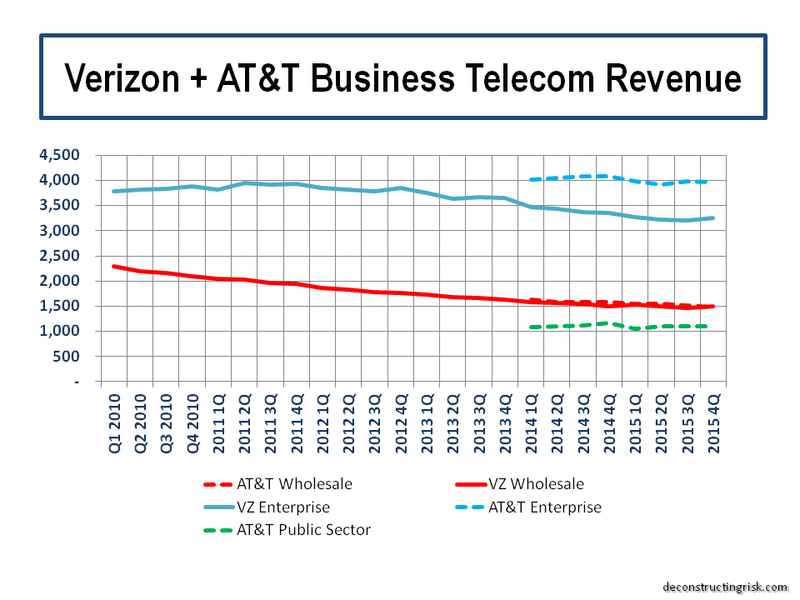 The graph below shows enterprise and wholesale revenues from each firm with AT&T showing revenue stability against a declined trend for Verizon. Numerous analysts confirmed their estimates on LVLT following the Q4 results and the average target is above $60, approximately 30% above the current level. 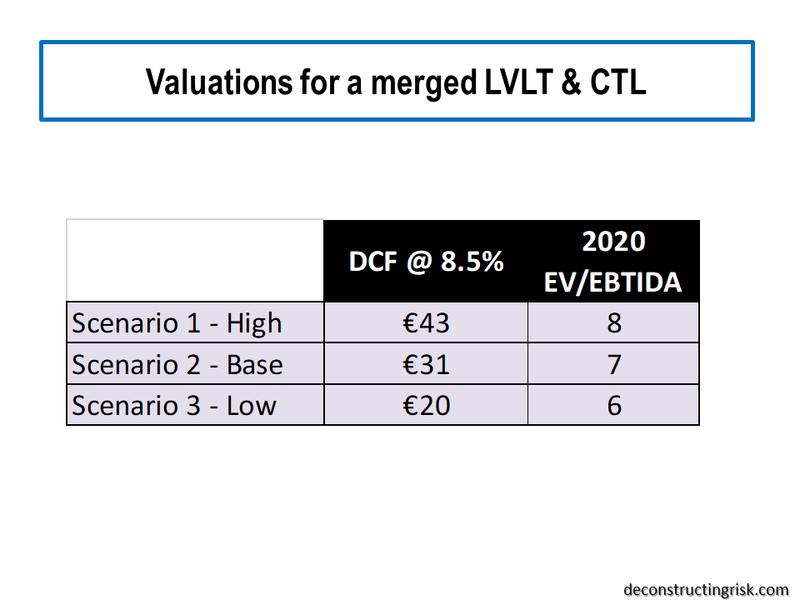 Regular readers will know that normally I don’t have much time for analysts’ estimates but in this case my own DCF analysis suggests a medium term target of per share in the low 60’s is reasonable. 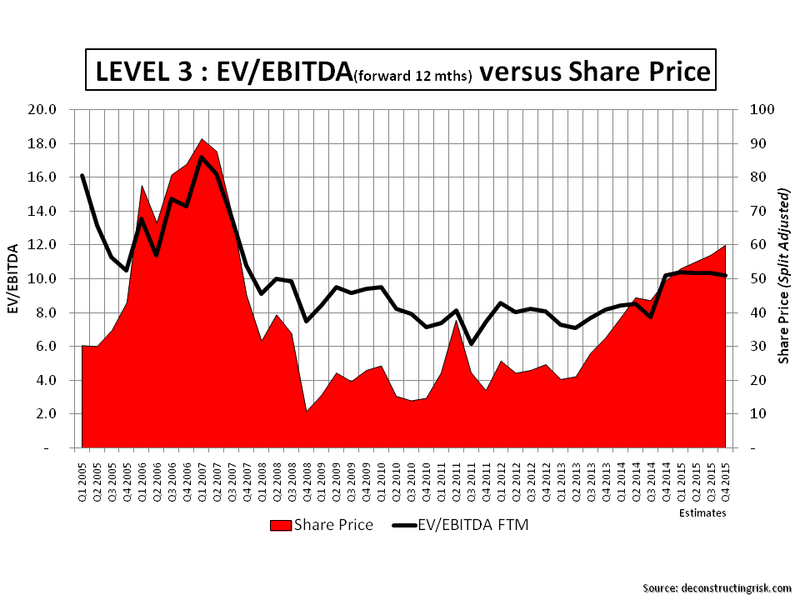 According to my estimates that translates into an EV/EBITDA multiple of approx 8.5 in 2018 which looks reasonable given LVLT’s free cash growth. I used the historical “as if” figures above to calculate a downside valuation for LVLT on the basis of a recession occurring over the next 2 years. I assumed that a 2016-2018 recession would have approx half the impact of the 2008-2011 crisis upon LVLT’s enterprise revenue (e.g. approx 7% decline) before stabilising and recovering. 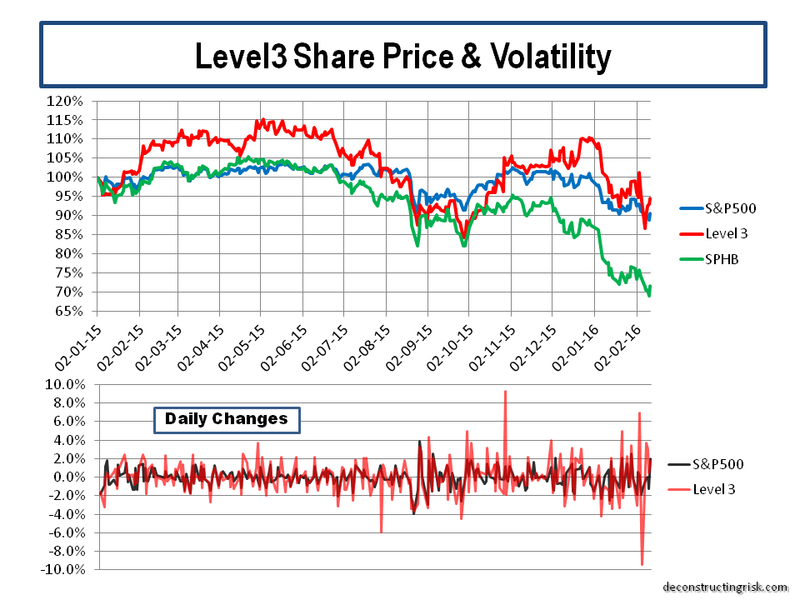 My valuation of LVLT in such a scenario was in the mid 30’s or an approx 25% downside potential from Friday’s close. So at a 25% downside and a 30% upside, LVLT’s risk profile is finely balanced. 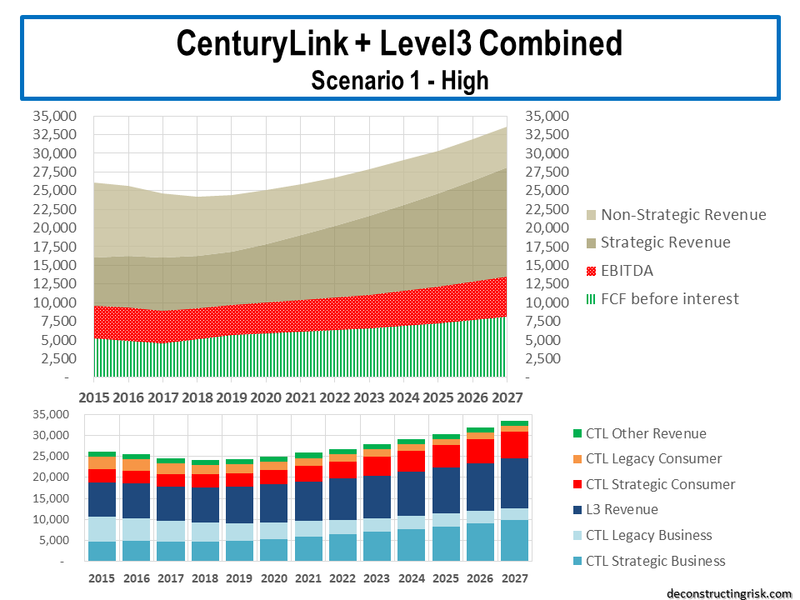 LVLT itself may become a target for a firm like Comcast or CenturyLink or another large communication firm looking to bulk up its regional reach or network business. 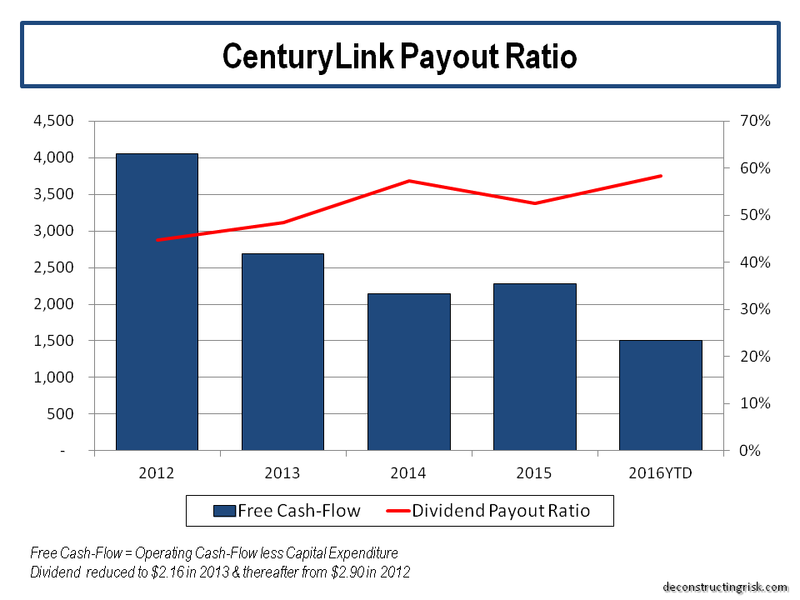 Two interesting items came out of LVLT’s Q4 call; the first being the tightening of its target leverage range to 3 to 4 times EBITDA (from 3 to 5 times) and the second being a renewed appetite by management to use free cash-flow for disciplined M&A rather than shareholder returns such as buy-backs or even initiating a dividend. 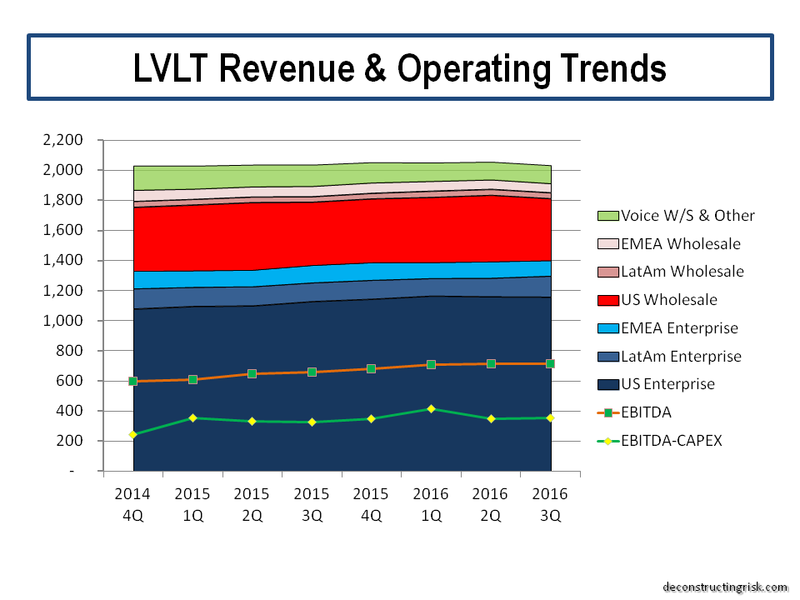 With LVLT proving their ability to get in excess of $200 million in EBITDA savings from adding TW Telecom’s revenue base of $1.6 billion at the time of the merger (or an impressive 12.5% EBITDA pick-up), the case for disciplined M&A by LVLT’s management is strong. Possible targets in the US include Zayo (their share price is having a hard time of late) or Carl Icahn’s privately held XO Communications (now that the maestro has milked the firms of its tax losses), amongst others. In Europe, possible targets include the now private Fidelity owned COLT (see this post on background) or Interroute, another privately owned pan-European network. Whatever happens, I am content to hold my position in LVLT at this level. 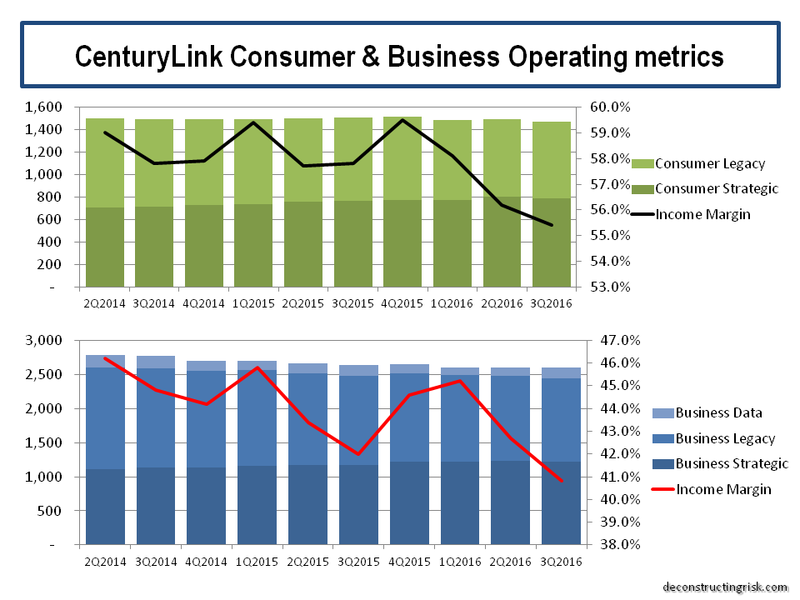 I like the firm’s current risk profile, the developing product range in the ever important network age, and particularly the recent execution record of management. As ever, I would highlight the stock’s volatility and recommend the use of options to protect downside risks (which are not inconsiderable if the probability of recession grows). I again repeat that LVLT is not one for the faint hearted, particularly in this market where near term volatility looks all but certain, but one I trust will be an attractive investment. It has been over 6 months since I have posted on the prospects for the telecommunications firm Level3 (LVLT) following its merger with TW Telecom (TWTC). I had previously posted on the strength of TW Telecom’s business model and its admirable operating history so I am extremely positive on the combination. 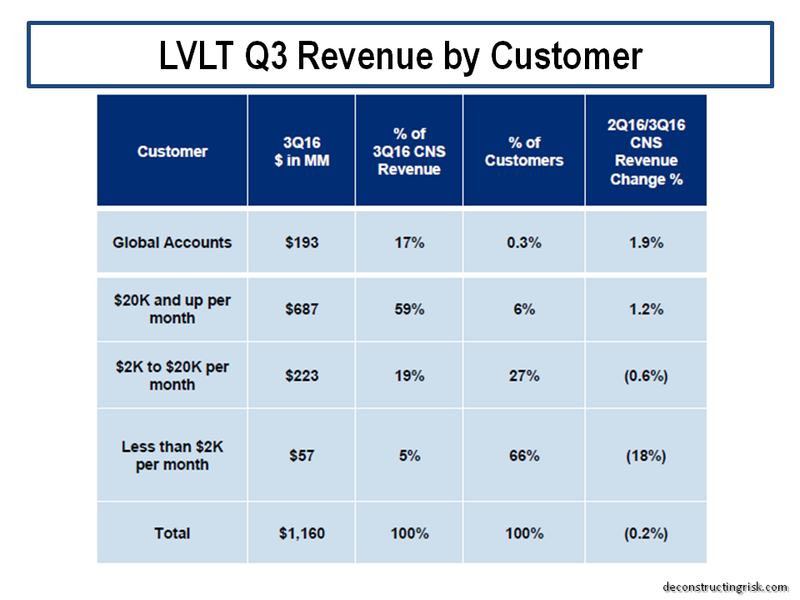 At the time of the last post, LVLT was trading around $45 a share, a five year high. Since that time, the stock fell to a low of $38 in October 2014 before reaching a new high in recent weeks around $54. 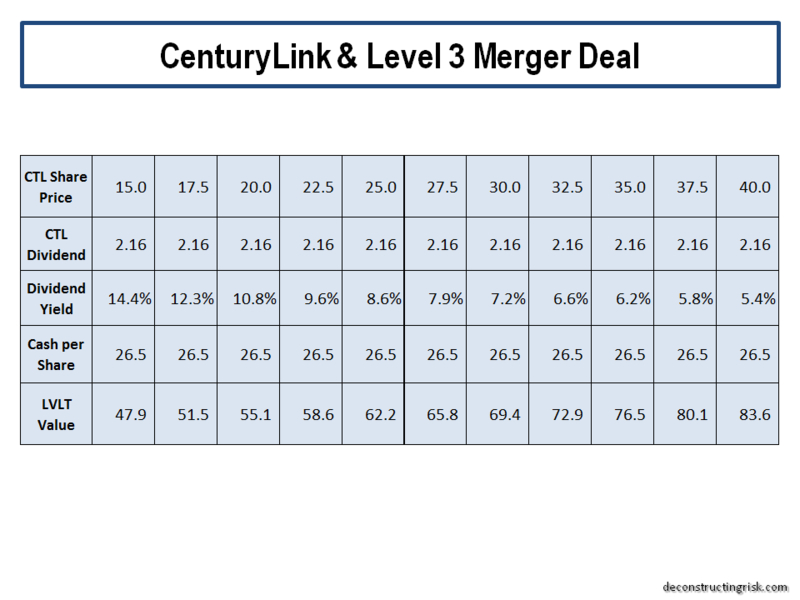 My previous post, using figures disclosed in a S-4 filing on the merger negotiations, made a projection that the combined entity could get to $9 billion of revenue and $3 billion of EBITDA by 2016. 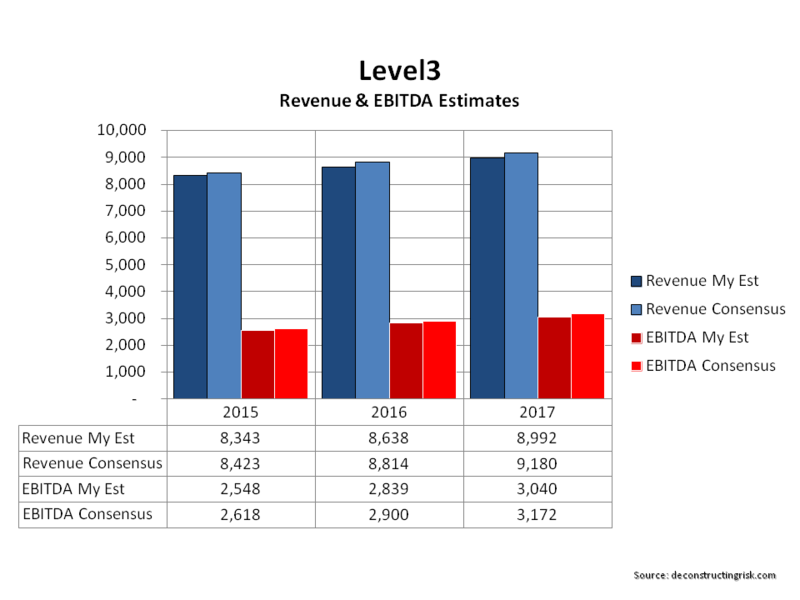 Based upon the Q4 figures, the firm’s guidance, and the recently filed 10K, I did some more detailed figures and now estimate that the $9B/$3B revenue/EBITDA threshold will more likely be in 2017 rather than 2016. My estimates for each against the consensus from analysts are below. LVLT is an acquisitive firm and has learned through multiple deals the optimal way of integrating new firms through a shape focus on the customer experience whilst prudently integrating operations and reducing costs. 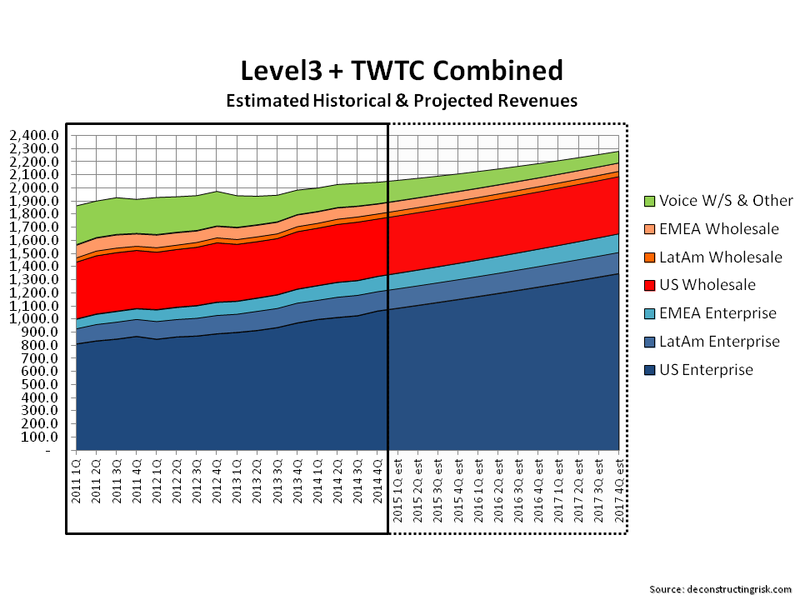 Taking the Global Crossing integration as a template, the graphic below illustrates how my estimates fit in the past. So, the question now is whether a share price in the mid to high 50s is justified (the average consensus is around $57 with the highest being Canaccord’s recent target of $63). 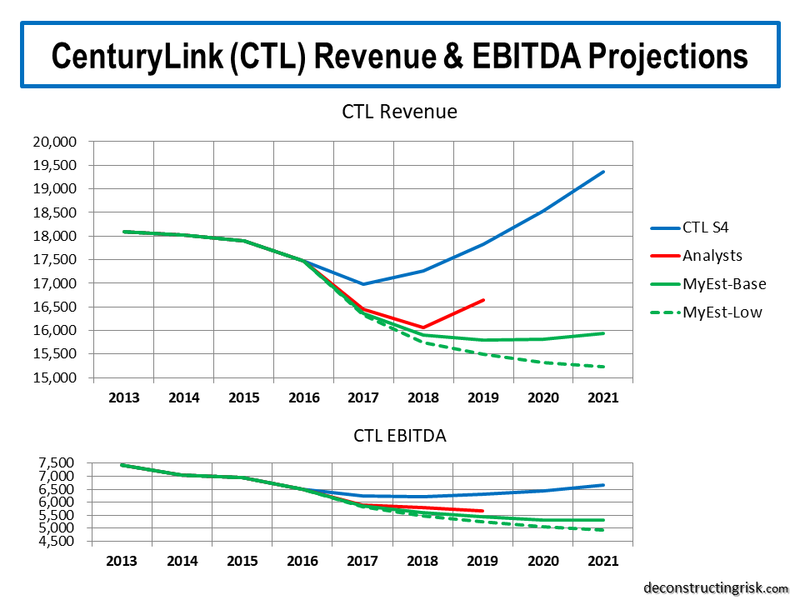 Using an enterprise value to EBITDA multiple based upon a forward 12 month EBITDA figures (actual where relevant and my estimates from Q1-2015), I think a target between $50 and $60 is justified assuming a forward multiple of 10 to reflect growth prospects, as the graphic below illustrates. My DCF analysis also supports a target in the low 60s. In my view, the key in terms of valuation is that the integration goes smoothly and that revenue growth in the enterprise market is maintained. 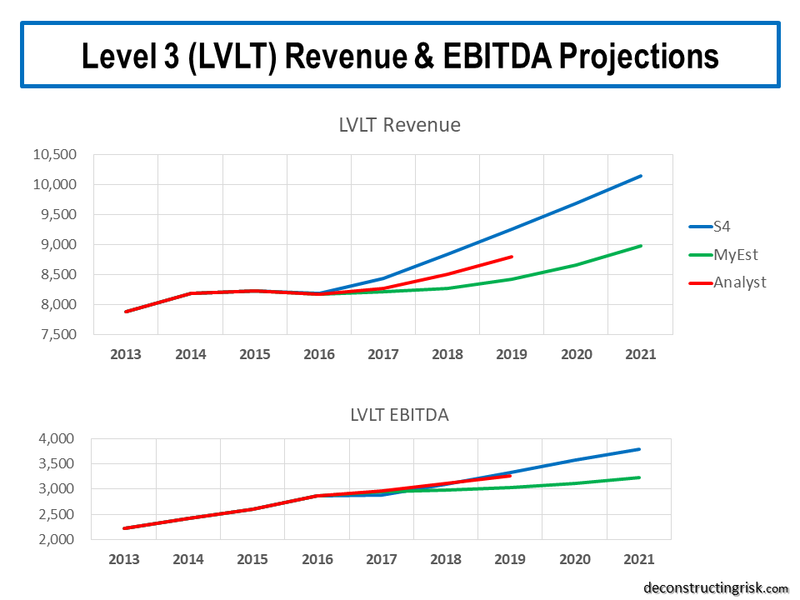 One of the principal reasons for my optimism on LVLT is the operational leverage the business has as the mix of its business moves more towards the higher margin and stickier enterprise market, as the pro-forma revenue split shows. As always with LVLT, I recommend using options to protect downside and waiting for a pull-back from current highs for any new investment. This stock has historically not been one for the faint hearted. I do believe however that they are on the path to a more stable future and it remains a core holding for me.